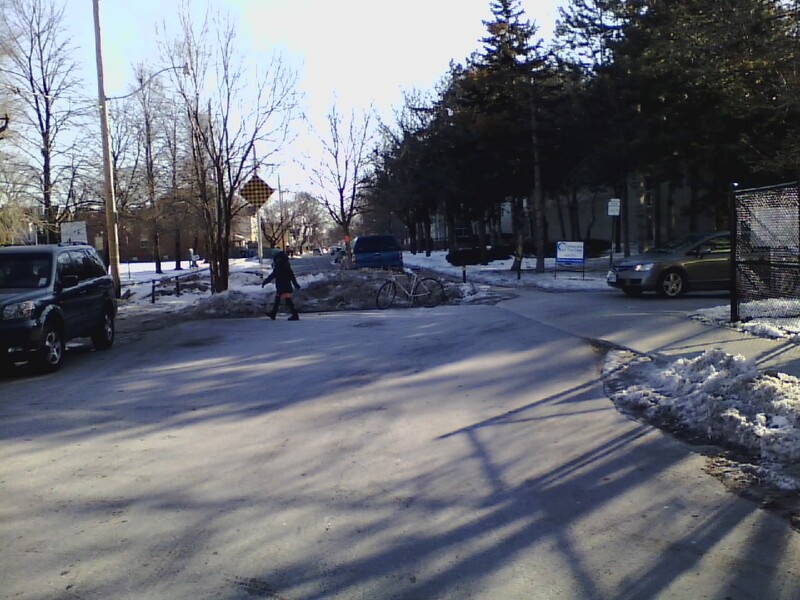 Ward 30 Councillor Paula Fletcher, City Staff and Ward 30 Bikes conduct a site visit to see if it’s possible to create an cut-through on this Traffic Island – Felstead Avenue, one block West of the Greenwood Bike Lanes, four blocks South of Danforth. Below we’re measuring just how wide we can make the cut, by measuring existing posts nearby that – to us cyclists – ‘feel’ comfortable riding between. Felstead Ave Cut-Through Site Visit – 2014-02-28 9:00AM – with R. Joshi (camera), J. White, D. Egan, Councillor Fletcher, P. Young, M. Holloway. The first factor was making sure the cut was wide enough for the width of a Bike Trailer – hopefully this cut-through can be Much wider than that. I explained – wider means we care, *that wide* about cycling as a legitimate form of transportation. 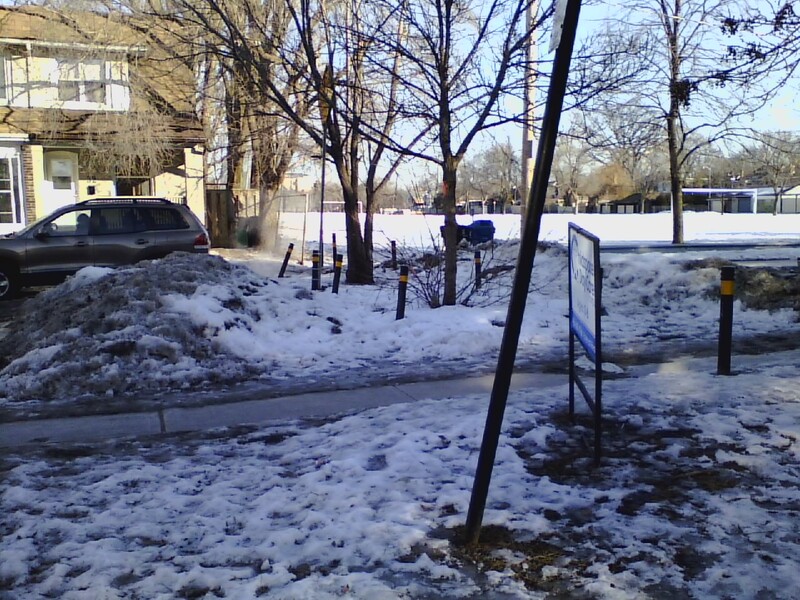 With the Traffic Island fairly buried in snow – it was hard for Staff to tell, but it looks like it’s a poured curb with paving blocks just laid in on top of the black-top. 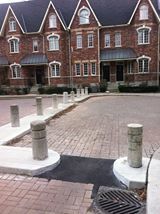 If this is so, the plan would be to cut the curbs and create two islands; with a nice wide path right down the middle. A similar (but not wide enough) cut-through was accompluished at Huntley St and Earl Place last year (see image – right). We noted several things that needed to be fixed up on the structure – so our cut-through may also make the amenity better at the same time – bring it back up to it’s original state at any rate. A neighbour we talked to told us that all kind of kids and cyclists use this street – she talked about how everyone just hopped the curb and rode on the sidewalk. A cyclist came though during our time there, doing the curb-hop thing – I mentioned as he passed me that we we were trying to get a path-through created. He immediately said “Great!” – as he hopped down off the sidewalk and onto the street again, heading towards the Greenwood Bike Lanes. More of us ride the winter than most people think. 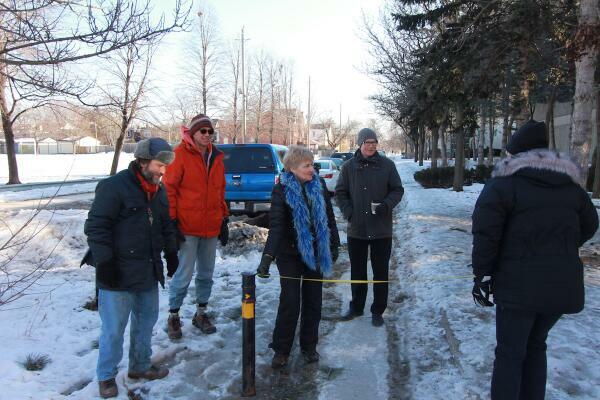 Next Post @Ward30Bikes ‘Pre-Walk’ of the @TTCLeslieBarns Public Liaison Committee’s – March "Safety Walk"